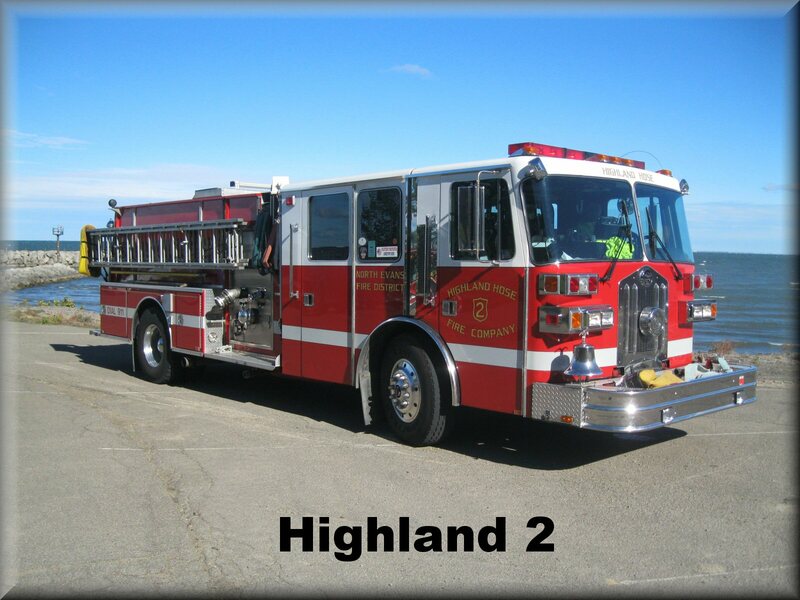 This is Highland 2. 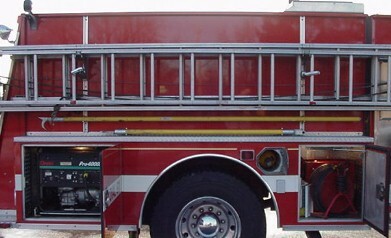 It is a 1992 Sutphen "Class A" 10 Man Pumper. It seats 8 in the Rear and 2 in the Front. This truck is first out for All Mutual Aids and is our car accident Engine, it also responds as the 2nd in pumper for all Fires. It has a 1500 gpm pump and a 1000 Gal. Tank. The Rear of the truck houses our gas powered portable light,"hydrant bag", 2 Short lengths of 5" Hose,a Cord Reel,and our Hose Roller. We also carry 800' of 5" Hose and a 2 1/2" Hose w/ Nozzle Attached. 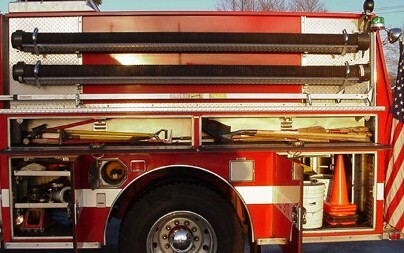 You also have access to the Deck Gun from the rear hose bed. This side carries spare SCBA Bottles, Hand Tools, Hose Fittings, Safety Cones, Speedy Dry, a Foam Tank w/ Nozzle, a 10' Attic ladder and our Hard Suction Lines. The Green light in the rear is our "Ready for Water" Light. It goes on when the operator is ready for the hydrant to be turned on. 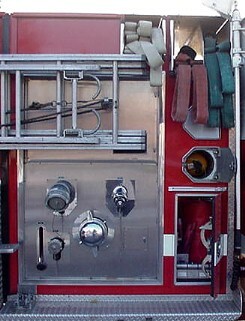 These are the pump panels where the water from the hydrant comes in and goes out to other trucks or hoses. 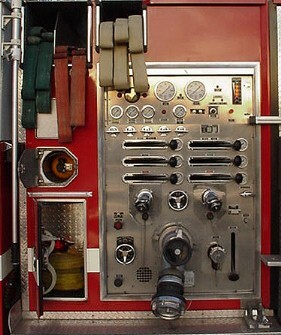 Here the operator can control the pressure for all the hoses and deck gun. 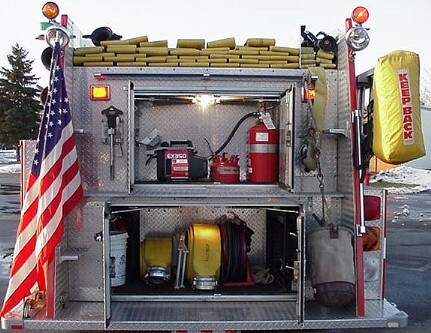 We have 3 attack lines as well as a Deck Gun thats on top of the truck and a "Trash Line" on the front of the truck. This truck has 3 intakes one on each side and one in the front. We also have the capacity to refill Tankers if called to. This truck also carries spare SCBA tanks, Forestry Hose, Tarps and other equipment. This side carries our generator, spare SCBA Bottles, Flares, Pike Poles, a 36' Ground Ladder, Cord Reel, 2 Tele-lites and an exhaust fan.